This is an article about Terra (our new puppy we brought home just 13 days ago) She’s really a sweetie pie and has her very own charm. We are still getting to know her and vice versa, but we already know we can love her dearly. Aside all these, she is currently battling through her cough (which has been confirmed just few days ago as Kennel Cough). This has been physically and emotionally stressful to all of us. 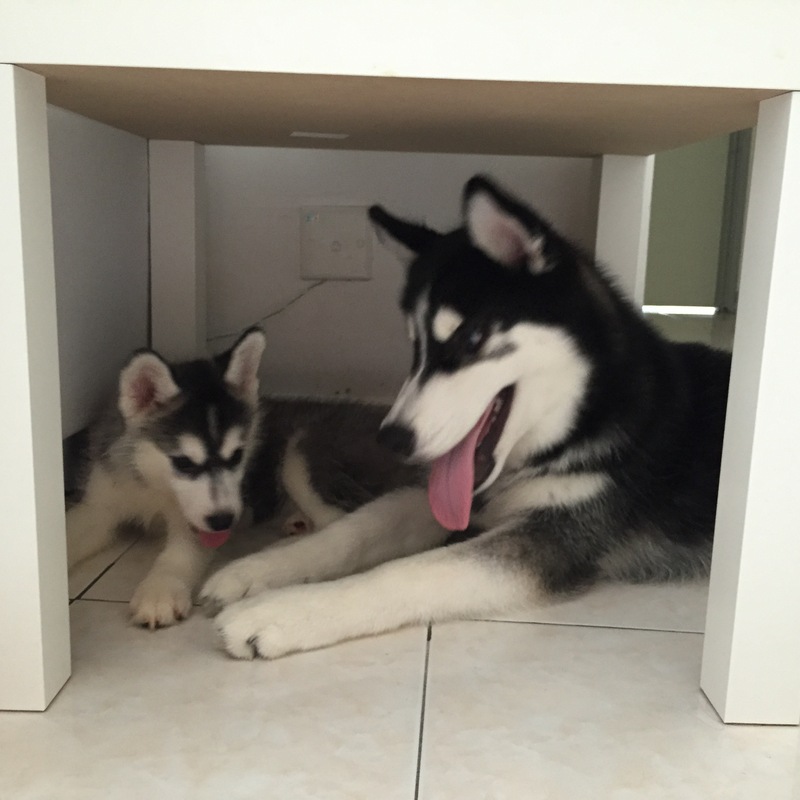 While Cloudy really love her new sister and can’t live without her; I as a dog-parent of two huskies, cannot allow the healthy one playing with the sick one. Anyway, I’m writing here as an official statement of Terra’s condition and history from the day we bring her home and call her part of our family. Kennel cough is not a major illness, but it can be very disturbing and worrying. And hopefully, what Terra and us is going through right now can help many other new dog-parents in the future. We were very excited to bring Terra home. We have waited 3 days to decide and officially bring her home after we got everything ready for her. (toys, play pen and multiple wee wee pads). 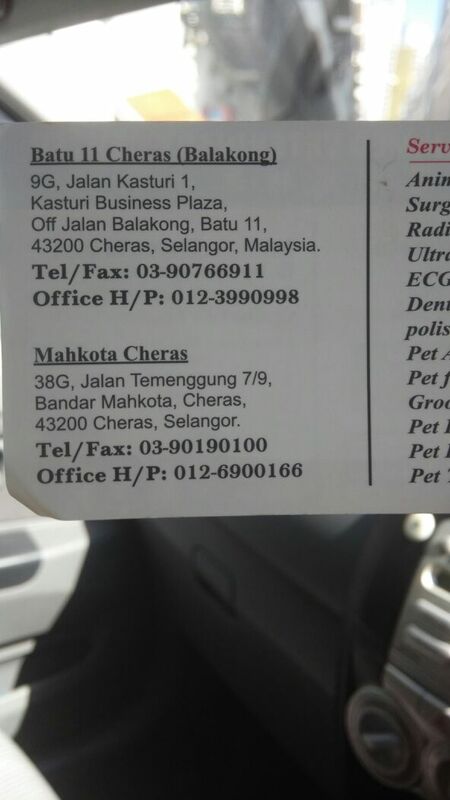 When we went over to the shop (The One Kennel), we gave a call few hours ago to request to bathe her and cut her nails. She definitely smell good and she’s one active pup. Except all her 8 nails were bleeding due to it being trimmed too deep. We were given an antiseptic cream to apply and it was fine. She has a cough a little as mentioned by one of the staff but it could probably due to after shower cold which is pretty normal for puppies after bath. Cloudy was once like this for a good two days when he was this young. We brought it to the vet for a full medical check up. The vet we always trust with Cloudy. She was a little bit weak on her lungs and her vaccination was done too early at a young age and we have been advised that her immune system will be weak. She has a little cough and lung inflammatory and was given antibiotics and mucolytics and viatmin E for treatment. 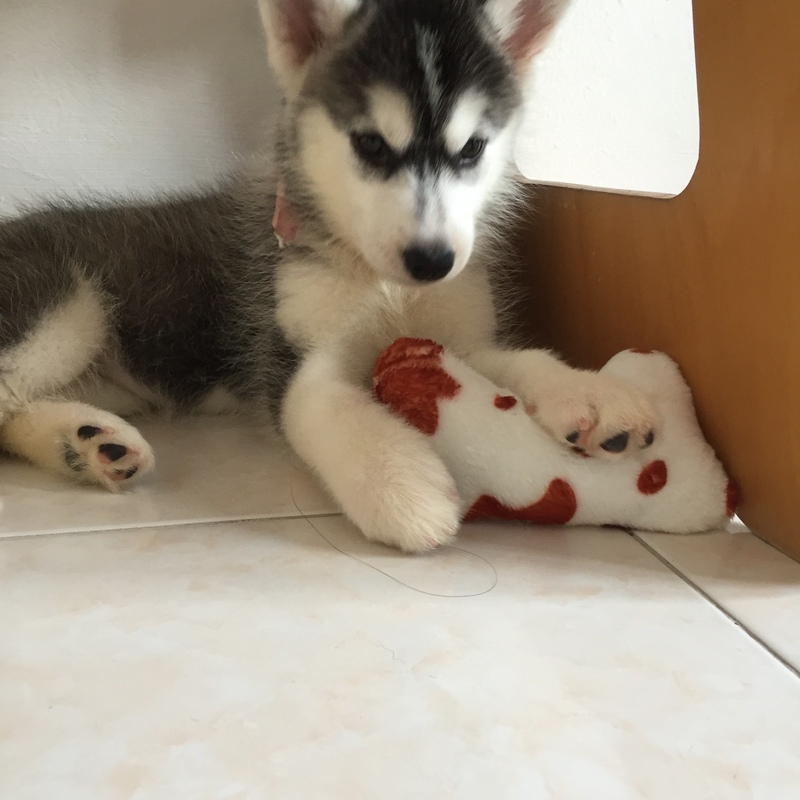 We were advised to contact the shop regarding her condition but we were so confident that Terra would be a fine puppy … after all we have been through Cloudy with much worse condition. Terra cough goes from minor to worse. Just 2 days before the 7th of January, her condition of her cough become more often and constant and really disturbing to see her that way. We bring her to the vet again and have her checked together with our boy Cloudy. Her lungs were inflamed as we were told and was prescribed two meds on top of the current ones that she has been taking. All we could do at this time was to wait and see if her condition worsen. Side track a little : Cloudy was completely OK but with just a muscle pain due to too long of walks.. Two days after this, she was having diarrhea.. And it saddens me to see that her condition aren’t getting any better but worse. We were worried sick. Just three days after the 2nd vet visit, we made a booking with another vet to get a 2nd opinion. 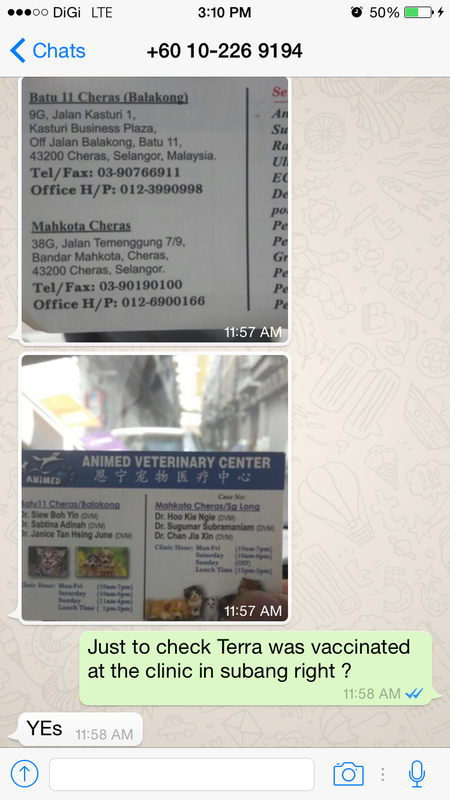 Just a note, we do trust the two vets we visited and our family / friends canine also go to them for treatment. They have been very good to both our babies. We have told about the condition of Terra and was confirmed to have kennel cough. At the same time, we have one of our friend’s Chow Chow puppy who were bought from the same shop also have early symptoms of coughing (similar to Terra). We were given antibiotics and mucolytics. Basically the same as were prescribed previously and were told that there are no medicine to cure kennel cough other than letting her battle it with her antibodi. And so what we can do is just to continue monitor her cough. I finally decided to write to the shop (The One Kennel) about Terra’s condition after knowing about my friend’s Chow Chow puppy confirmed to have the same sickness and symptoms. I gave her a few calls but no answer and wrote it on their wall post. I appreciate their reply in the night where they gave me a call concerning on Terra’s condition. To be honest, I never expected their reply. But since they call, I honestly told them about Terra’s living condition and provide any requested information from them. Both phone calls and on whatsapp text. They have given me a called prior to advising me to go to their panel clinic and I have requested them what type of medicine should Terra be prescribed (as we trust two of our vets who have looked into Terra). They’ve suggested that Terra should take something to help / and stop the cough which is called something Zithromax . I have googled this and it is to treat infections caused by bacteria, such as respiratory infections, skin infections and ear infections. Kennel cough is something that can caused by viral infection and bacterial infection. Reading this and have consulted this with our doctors, I would assume is nothing different from the antibiotics our vets have been giving her. I personally think I shouldn’t be giving Terra more medicines if it’s the same result. I have explained our reasoning that we are skeptical to go to their panel vet to be diagnosed again and with new medicines and have asked them if it’s OK to have our trusted vet to give them an official letter to state what prescription our doctors gave our pup and what’s the screening results. They do prefer us to visit their panel vet which they have mentioned over the phone to bear the medical cost and have also given us an option for us to collect the Zithromax from them. 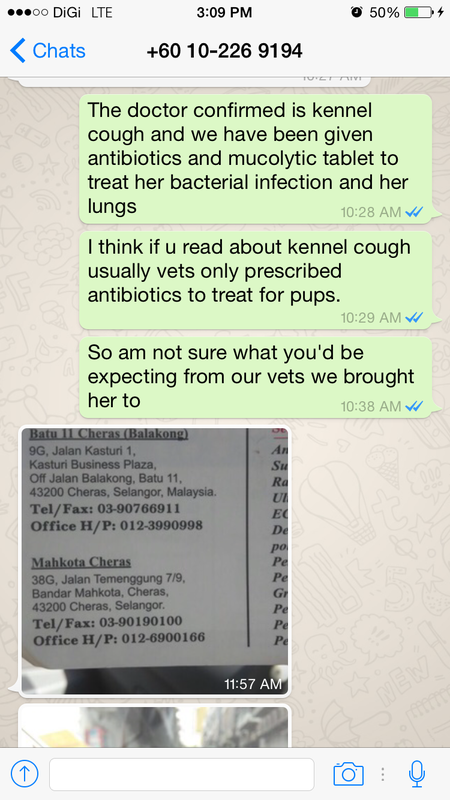 We do trust our both doctors, Dr.Simon and Dr.Clement who both have help treated our very sick Cloudy in the past. And we are very confident Terra would not be a problem for them. Honestly, in our own opinion, we are very skeptical on prescribing new medicines and is too early for 3rd opinion while we still have a list of trusted vets to go if we want a 3rd opinion. (Gasing vet Dr. Prem is in one of our list – whose known for treating big breed dogs) We have written a consent reply to them as part of our responsibility to inform that we will forego their advise to go to their panel vet. To us, the damage is done and the only way to move forward is to do what we can on what we choose to trust. We have two (three I would say) in our contacts reserved for Terra and Cloudy in case of any emergency. Right now, the only thing we can do is to continue to give sufficient of TLC to our Terra princess and Cloudy boy in hope both of them would get better. One thing to call for celebration is that Cloudy did not seem to get any cough symptoms other than his diarrhea after apple cider vinegar and now loosing appetite (worrying yes, but is continuously under monitoring) If you’d ask why don’t I separate them , well I guess it’s too late now since Terra is assuming to get the cough on the 1st day itself which both of them have been in contact every day… Cloudy would have already gotten it. But now we are taking extra precautions that both Terra and Cloudy is constantly under monitoring. Gonna get them some vitamin-C to boost up their immune system. I would say that this is an unfortunate that we brought home a sick puppy (TWICE in a row) but we will do everything we can treat them. Yes, we admit we shouldn’t buy from shop or unknown breeder history. Please do not bash us on this, we admit our mistakes TWICE. The first was Cloudy came back as a real sick puppy too at 6 weeks old from a source we found in petfinder.my and brought him back from Klang. The second for Terra, which we make two visits prior deciding to getting her from the shop and confidently thinking that this time, her at 8 weeks old is an active healthy pup. The damage is done and all we can do now is to move forward to continue to nurture them. If there’s a 3rd time, (which will NOT happen), we definitely will remember and remind ourselves to take precautions such as these. As to why we didn’t choose to adopt but instead buy another husky ? Well again, please don’t bash us on this. I personally do encourage adoption and I am not against it at all. The reason why we brought Terra home was because she’s a lovely pup that we know we will try and love her as much as we can. She’s a pup and she’s cute, there’s no doubt! I am guilty that she caught me at her cute face and her smile with her tongue sticking out. Prior to getting her, I have screen through some adoption list in petfinder.my and have constantly check on husky for adoption if I came across one. I have also read about adopting an older dog and how to get along with my current pup… I read about the pros and the cons and I do agree both sides are doable. 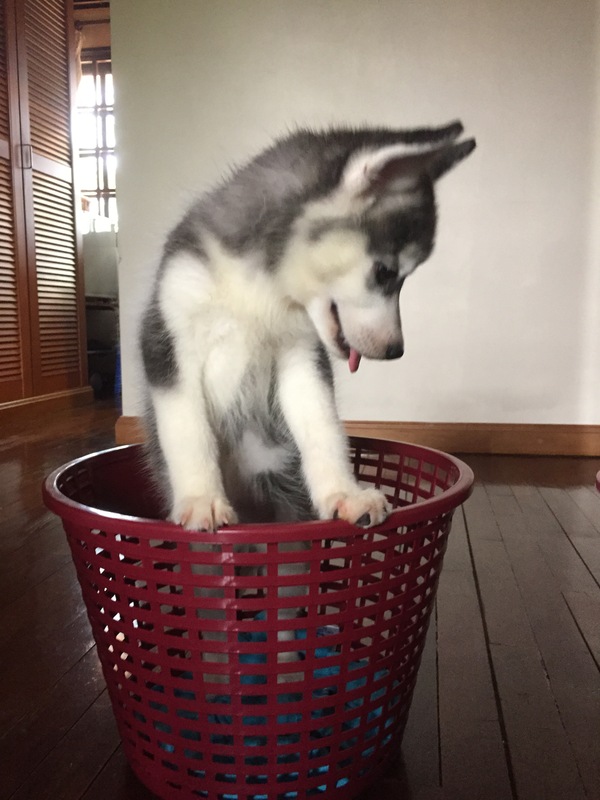 And yes, the choice we take that I personally think its best for me and my family to have a young pup where we can fully bond with and build their own character through our nurturing. I don’t deny I am having trouble with Terra now with complete opposite personality from Cloudy. But I am in my difficult and stressful stage and I am confident we can get over this. We just need a little bit more time. Every dog-parent who bring home a new dog (whether puppy or adult) goes through the same. Here’s some cute and lovely heart melting pictures of our feisty little Terra. Don’t be fooled by her size. She’s one chili padi! 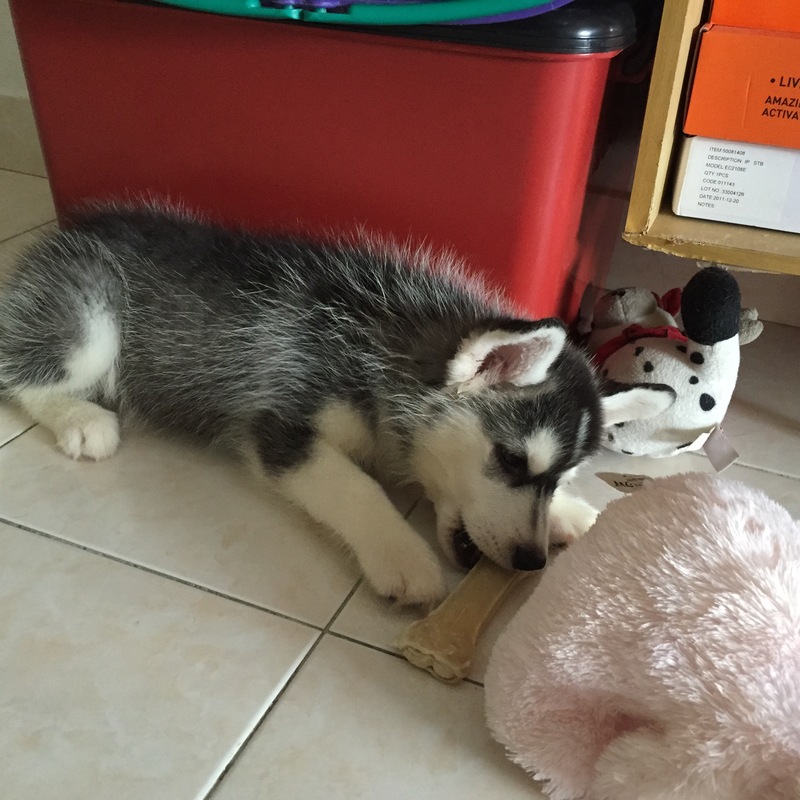 She has grown from 3.6KG on 31st December 2014 to 4.7KG on 10th January 2015. 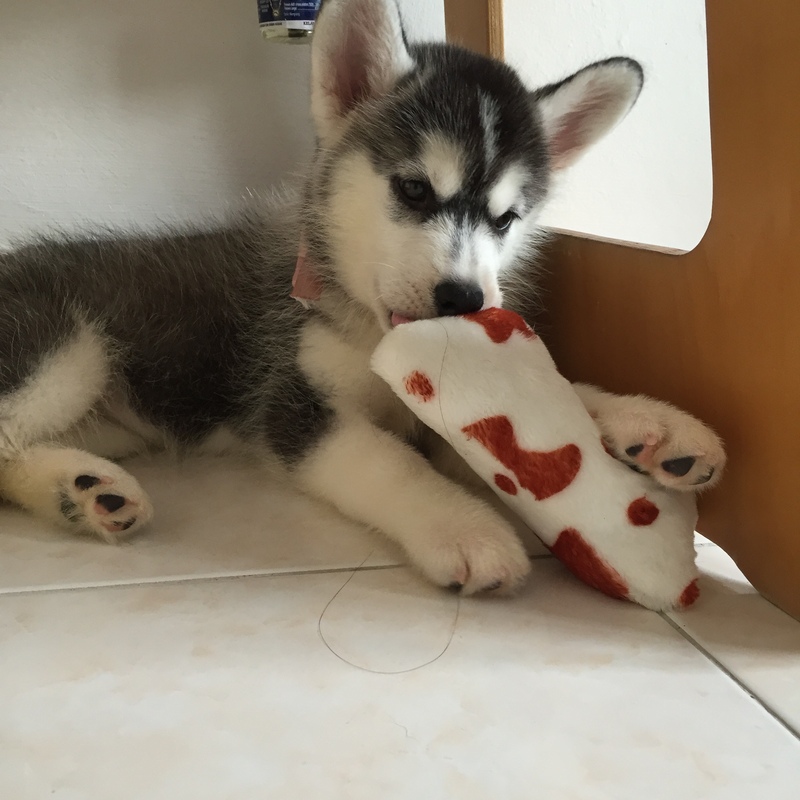 If you’d like to check out her updates and also her big brother Cloudy, you can go to our Facebook page . Disclaimer: This post is not sponsored and have no intention to create any controversy remarks. I am only a small time blogger and all opinions are my own. Next All set for 2015!